Glad to know there are waterfall lovers like myself. I am enjoying the website. I thought I would post to you a picture of a waterfall in California that is northwest of Tahoe. 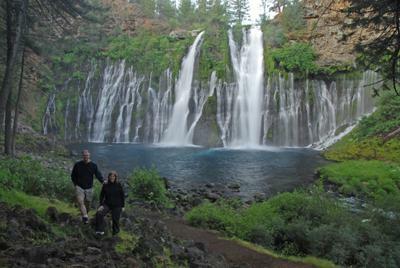 It is called Burney Falls. I did not see it on the web site and thought I would give you the heads up so that if you are traveling through there you could stop by. I am not sure how I got wind of it, but we drove through the night from Colorado Springs to see it because did not want to mess with the rest of family vacation plans. The water fall has two main falls that come over the top and the rest of the falls are come through old lava tubes. I have included the one with my wife and I for scale for you. Hope you’ll get to see it sometime.